Brides have legit concerns about mens beach wedding attire for their cheap Florida beach wedding. It is good to set guidelines for mens beach wedding clothes. As gauche as it may seem, unless basic guidelines are provided some male guests will interpret the words "casual dress" in the same sentence with "beach wedding" far differently than anyone could anticipate. Trust me on this one. Sadly, many a Florida beach wedding has been dampened by guys showing up in tank tops and baggy cargo shorts...since this is the normal casual attire they wear to the beach. I know it completely floors the women who read this page, but guys never think to ask "What do you wear to a beach wedding?" All they do is assume. How, the bride wonders, do I tactfully and gracefully set guidelines for mens beach wedding clothes without offending one of our friends? Ladies, let's reframe things here. Yes, this may seem awkward at first, but keep in mind you are not asking anything that is high-maintenance. This is your Florida beach wedding and you know exactly how you want things to look. 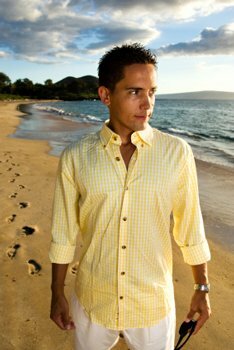 Traditionally, mens beach wedding clothing consists of collared tropical weight shirts, and dress khaki or loose linen pants. Nice Guayabera-styled white shirts or colorful Hawaiian Aloha shirts are pretty standard. Men finish things off with sandals or boat shoes without socks. * Discuss your wishes with your fiance. Let him know this is important to you (if it really is) and enlist his help in creating a small insert with dress guideline in the invitations. * Dress shorts or long pants. No jeans, cutoffs, or bulky cargo shorts. * Absolutely no baseball caps. * Keep in mind that there will be some guy who will show up dressed exactly how you didn't want him to look. Whether it is from stupidity, arrogance, a lack of class...whatever...you need to decide how to handle it. Turning him away might cause both a scene and hard-feelings. The best tip we've heard are brides that have several cheap Aloha shirts available at the wedding location with instructions to the ushers what to do. Florida beach weddings dictate a much different style in mens beach wedding apparel. The heat and humidity make traditional ties and jackets deal-breakers. * Cotton and linen shirts are the best options for beach weddings. Some Aloha shirts are 100% rayon and although they hold their shape well, they will a little warmer. 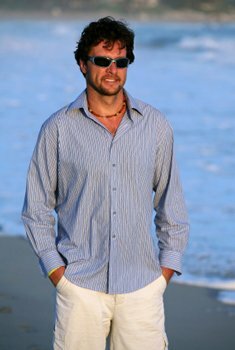 * In keeping with the casual nature of many beach weddings, the men’s shirts are often short-sleeved for both appearance and comfort. However, long-sleeved styles workout fine for Florida beach weddings in the late fall or early spring. * It is best if you can find a white Guayabera-styled shirt, but it is not mandatory...well, unless the bride insists on it. (Uh-oh...) It should be loose-fitting to encourage cooling breezes from the Gulf. These shirts are not tucked in. * I know I said Aloha shirts are appropriate mens beach wedding attire, but please make sure they are tasteful. Do not wear one with pictures of beer bottles or girls in bikinis. Show some class. There will be grandmothers at these ceremonies. Why are Treasure Island weddings so popular on the Florida Gulf beaches?